Delonghi has a reasonable foothold in the dehumidifier market and the DNC65 (whose full name is the Tasciugo AriaDry Light DNC65!) is their first offering in the desiccant range out of their 5 currently available models. Desiccant dehumidifiers are becoming increasingly popular because of their quiet performance and ability to operate at very low temperatures. So, let’s see how Delonghi’s first attempt to catch up in this market favours. 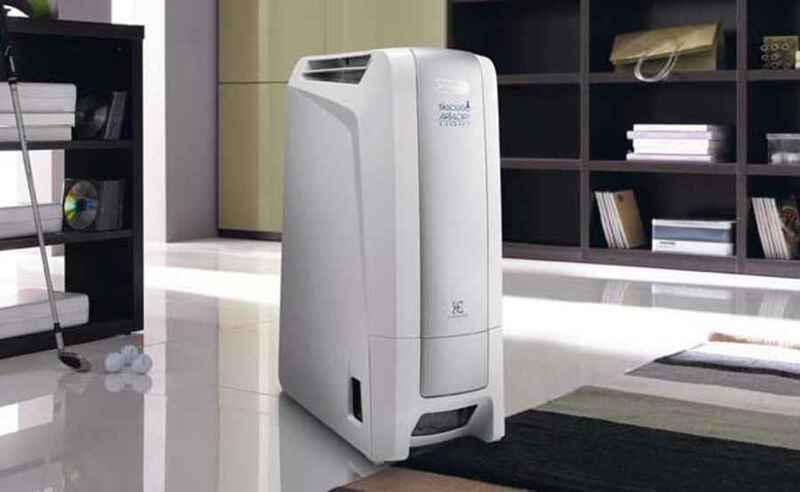 Especially since it has some stark competition from well established brands like EcoAir and it’s ever popular DD122 dehumidifier. The DNC65 weighs a feather light 5.5kg, and, at the time of this review, is the lightest dehumidifier available. It also boasts some very compact dimensions and measures just 28.9cm deep by 17cm wide by 47cm high. Making it ideal to be tucked discretely away in a corner or in your hallway without taking up any noticeable space (although placing it directly in a corner will hamper its performance – more on this later). A convenient folding carry handle is located on the top of the unit making it easy to pick up and move should you need to. Operating at its lowest setting it is also one of the quietest models too at 34dB. At this level it sounds like a quiet-ish hum, but is still very usable in your living room without drowning out the TV, for example. At its most powerful setting it is about as noisy as most other dehumidifiers (at 44dB) so if you need to use the high setting we recommend not using it in a room where you spend a lot of time. Air purification is beginning to creep in as a more mainstream feature of today’s ‘all singing and dancing’ dehumidifiers. So it’s no surprise to find one on the DNC65. When combined with decent filters they do provide some benefit to aid breathing problems by filtering out and removing airborne particles. The Ioniser on the DNC65 emits negative ions which cause airborne particles to become magnetically attracted to each other. When they clump together they become too large to remain airborne and fall out of the air that we breathe in. This has been shown to help breathing generally, but is also a definite benefit for people with allergies or asthma. 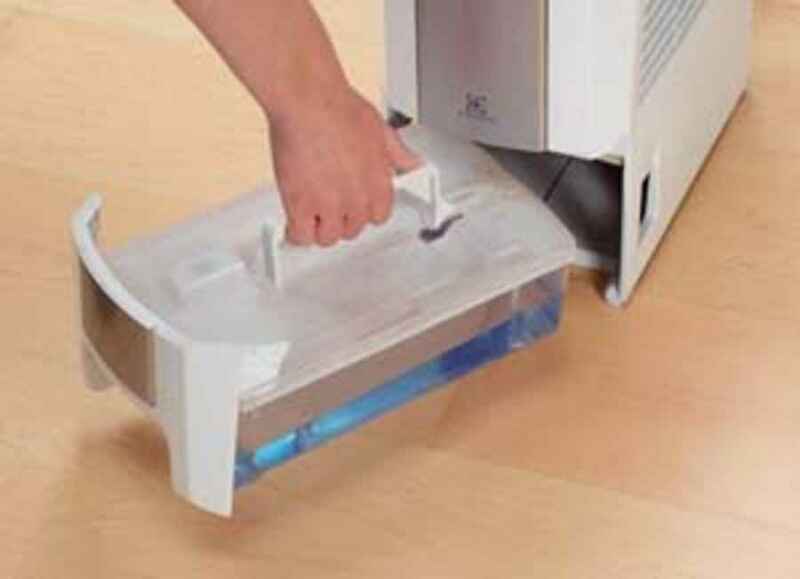 The control panel is conveniently situated on top of the unit and consists of an easy to use push button system that is sealed securely behind a water tight plastic layer. Each button has a small bank of soft glowing indication lights next to them, so you can see at a quick glance what mode the machine is operating in. The first button on the panel is home to the ‘dehumidifier’ mode settings and is denoted with a water drop icon. This gives you control over just how much water the unit will extract each day. There are a total of 3 settings: Max, Min and Auto. Each setting can be quickly accessed by toggling the ‘dehumidifier’ button. The Auto mode makes use of a humidity sensor and will aim to keep your home at around 55% relative humidity (RH). This is most ‘comfortable’ RH level and is recommended for UK homes. The Max and Min modes, are just that and will keep the humidity as low as possible or just low enough to prevent any severe damp problems. Next up is the laundry drying modes. There are two available: Turbo or Economy. Turbo is designed to help dry you washing quickly and is meant for use on winter days when the temperature might be a bit lower in your home which means the unit will need to work harder to draw in ambient moisture. Economy mode is designed for use on much warmer summer days, keeping the energy use of this machine to a minimum. Following on from the laundry button you can adjust ‘swing’ mode. This sets the swing arc of, what Delonghi refer to, as the ‘deflector’ on the top of the device. This is a lourve or flap that sits over the vent of the machine and can be used to direct the flow of the slightly warmer air which exits the unit. Currently you can deliver the air forward and vertically, forwards or just vertically. The final setting stops the louvre in its current position, fixing the air flow into one spot. This is a setting we’ve always found very useful to point towards damp patches or to speed up the drying of washing. The warmer air hits the surface and aids evaporation, this moisture is then absorbed by the dehumidifier. A very useful feature that is common on most mid to upper range dehumidifiers so we’re pleased to see Delonghi have included it here. Moving onto the next setting you’ll find another feature common to most modern dehumidifiers: the timer. The DNC65 allows you to select a timer of 2, 4 or 8 hours. One feature we noticed about this timer which is noteworthy is that it recognizes when the tank is full and suspends the countdown. When the tank is emptied and reset into the unit it will resume until the remaining time has elapsed. This makes sure the machine operates for the full time you specified and is a nice touch. The final button turns on/off the units ionizer (for more information on the ionizer see above). Lastly on the panel is a small set of two indication lights. Breaking from the usual tradition of including a ‘power’ and ‘tank full’ light. The DNC65 sports a ‘tank full’ and ‘alarm’ light. The alarm light is something you don’t really want to see switched on! It means there is a fault with the unit and the only advice Delonghi provides is to contact customer support. That said, it does come with a 2 year warranty and current reviews suggest the unit is hardy and lasts for a long time. The tank full light is just that, and will illuminate when the tank is full or inserted incorrectly. 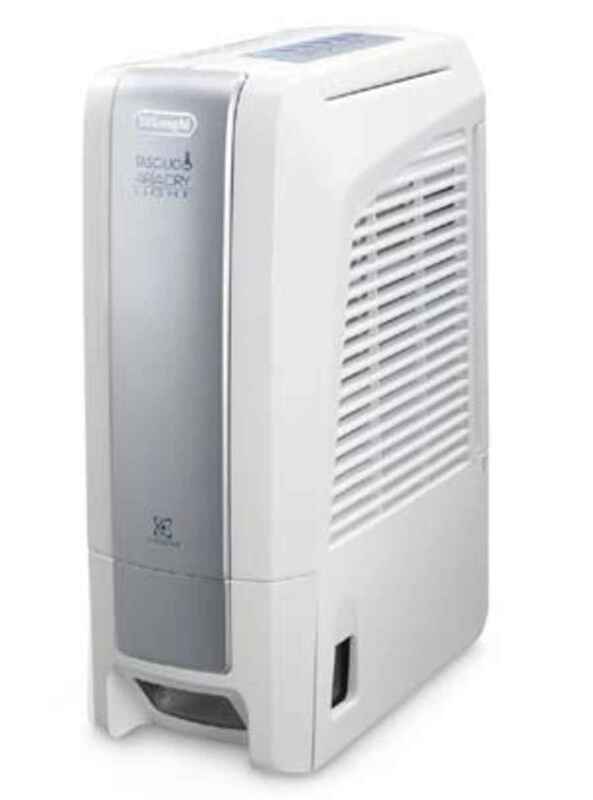 If you’ve read any of our other reviews you’ll know that a desiccant dehumidifier, such as this unit, can operate in a wide temperature range and does not suffer from the performance problems refrigerant units do at lower temperatures. The DNC65 can operate in temperatures as low as 1°C making it ideal not just for use in the home, but also any outbuildings or garages that may suffer from damp or condensation problems. Whilst in laundry mode the DNC65 can extract a minimum of 6 litres of water per day – no matter the temperature; and, because of the technology it utilizes, it is as powerful as most units that can extract up to 18 litres every 24 hours (when measured at 20°C, 60%RH). The tank is conveniently located at the bottom of the unit and can hold 2 liters before being emptied. This is average for a unit of this size and power. When full the tank is slid out of unit using a large and easy to grip handle. Once removed the tank has a folded carry handle, which popups, and a lid which makes carrying easy and reduces any risk of the water spilling on your way to empty it. The lid is then simply popped off and the tank emptied. This is a design favoured by EcoAir, so it is easy to see why Delonghi adopted it. The DNC 65 features an auto shut off system that protects the unit from damage. It will stop extracting water from the air when the relative humidity (RH) falls below 20%. This is not the most efficient implementation of this feature we’ve seen, however. 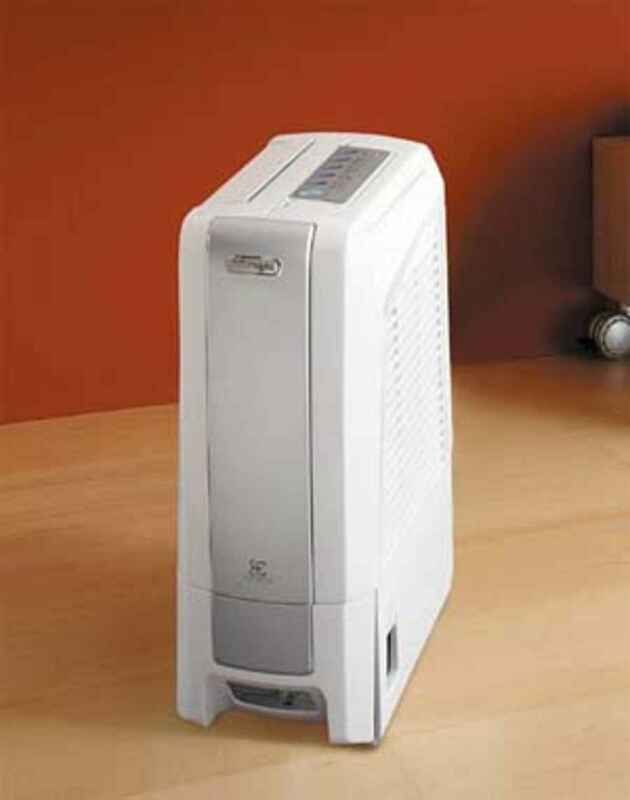 In fact most dehumidifiers will not dry the air below 30% – 35% RH before turning off. This is because the air will be uncomfortably dry by the time it does reach 20% RH! That said, it is very unlikely to get this low even with regular daily use (depending on the ambient temperature and humidity levels). Positioning the unit for maximum effectiveness means it needs to be at least 20cm away from a surface on all sides. This is shame because the unit is quite discrete and having it more in the open will make it a little bit more noticeable than if it was tucked directly against a wall. But we cannot be too harsh about this because it is an affliction common to virtually every dehumidifier. Like all dehumidifiers the performance will decline if the filter is allowed to get dirty. Delonghi have recognized this and provided easy access to the filter which simply slides out of the back of the machine. It can only be cleaned with a vacuum cleaner and washing it with water can damage the filter. The DNC65 is something of a mixed bag. On one hand it is a quiet, easy to use and small unit. But on the other it is lacking the fine tuning and controls we’d expect to see on a unit in its price range. It is a powerful unit, but for us, is just slightly too expensive for what you get. So if you’re thinking this unit might be for you we recommend checking out its closest (and slightly cheaper competitors at the time of this review) such as the EcoAir DD122 mini or the Meaco DD8L before settling on the DNC65.